Traveling to Spain, a sin not to visit Andalusia. 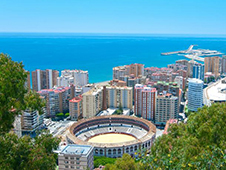 "Pearl" of the region have Malaga – colorful and big port city. Rich in reminders of architecture, large gardens and white beaches, Malaga also gave the world the great artist – Picasso. If you like his work, you can visit the two museums, which will help replenish your knowledge and live to see many paintings. 5 years ago, opened the international airport Costa del Sol, which is situated 8 km from the center of Malaga. The town is popular as it is today on the Costa del Sol – the fourth busiest airport in Spain. To explore the city and its surroundings as much as possible, you can rent a car at the airport in Malaga. Choose the best option price-ratio requirements will help site bookingcar.ru. In order to rent a car in Malaga, the driver must be over 21 years old, have driving experience more than a year and lay claim to international standard. overtaking cyclist is allowed a minimum of 1.5 meters. The size of the penalty depends on the nature and gravity of the offense. The minimum fine for today - 100 euros. When paying small fines on the spot or within 15 days, the driver will be a "bonus" for the timely payment of a 50% discount on the amount of the fine. The maximum penalty - 600 euros. For repeated violations may temporarily take away rights. If you take a rental car, which is registered for the fine, you will have to pay: on their own through the Internet at the request of the traffic police department, or the entire amount will be charged by the distributors, with your credit card. Get behind the wheel of a vehicle after drinking alcohol can be only if you drink a glass of beer or wine, no more. Breathalyzer should show maximum 0.5 promile blood alcohol and 0.25 promile breath. If the driver has a minimum allowable length, the norm for him - 0.3 ppm. Drinking and driving is classified as a serious or extremely serious offense and shall entail a fine of 200 euros. Also for this type of violations are often practiced divestment. Find parking in Malaga is easy. Hotels and restaurants are always parking spaces to its guests and visitors. In addition, there are many outdoor and underground parking spaces. If you leave the car in the outdoor parking, pay parking is possible through the machine, which will issue a parking ticket. It must be attached to the windshield from the inside. The price of parking - 1-2 euros for a few hours. Closed parking more expensive, about 5 euros for 1.5-2 hours. You need to pay at the exit of the parking lot. All parking can be paid in cash or with a card. From Malaga, almost all roads are free: highway A4 in the direction of Madrid, the A7 motorway, the national road 340. Exception - AP-7 highway in the Guadiaro (Guadiaro) length of 105 km. Directions on it will cost the driver to 10.7 euros.